According to a recent poll, nearly ⅓ of the workforce reports receiving no formal training, and employees list training as one of the top 4 reasons they leave a job. That’s why training your team for each presentation they give is paramount to their success and ultimately your company’s success. Whether you have 1 person presenting the deck to a small audience or 100 people presenting all over the world, the importance of training is the same. Effective training will increase your team’s comfort level with your new deck which, in turn, will drive the efficacy of the new deck. Help them personalize the deck. There is nothing worse than listening to a presentation that is clearly being repeated over and over by who knows how many presenters. These types of presentations can come across as generic and inauthentic which can hinder their overall effectiveness. Allowing your team time to personalize the deck is a powerful tool to overcome a lack of authenticity and replace it with transparency. Show them specific spots throughout the presentation where they can work in personal stories or experiences, and help them to capitalize on those moments. Show your team what you envisioned, and give them tips to bring it to life in their own words. Presentation Tip: Write out your own personalization of the deck, and send it to your team. This will help them understand your vision more clearly. A big part of training your team on a presentation hinges on allowing them time to practice. You can’t expect them to deliver with excellence if you never give them a chance to get comfortable. Depending on the size of your team, take time with each team member who will be delivering the new deck and work with them individually. If your team is too large to meet with each person, assign coaches who you have personally trained to pass along the same training to your team members. By doing so, you will ensure that your deck comes across in a consistent voice no matter who is presenting which will ensure a clear and effective message. Presentation Tip: Schedule practice time into your team’s work week, but make sure you eliminate something from their calendar to make up for the added commitment. Wearing your team thin is a quick, easy way to help them fail at executing the new deck effectively. You have poured time and energy into designing your presentation, which means you have likely spent the most time living with the content. Take time to note any potential sticking points that will come up as your team delivers the presentation, and then coach them through those ahead of time. By thinking ahead, you will help your team succeed on the first try rather than needing time to settle into the new presentation. This will help them to feel like they can knock it out of the park which will ultimately shine back on you as a manager. Presentation Tip: Give tangible ways to overcome potential obstacles, pushback, or skepticism from potential audience members. 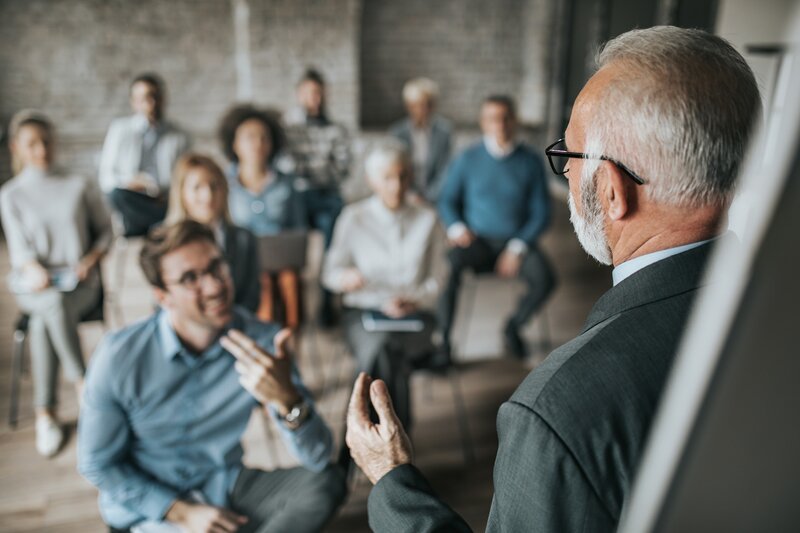 By equipping your team to handle unexpected questions and concerns, you’re ensuring that they will maintain their authority with the audience as they provide effective and thoughtful solutions. Training your team on a new presentation is key to successful delivery. By implementing these 3 keys, you will set your team up to succeed in a powerful way which in turn will lead to an increase in engagement and overall effectiveness. Looking to learn more about how to deliver a powerful presentation? Contact the team at Ethos3 to find out how to bring one of our Presentation Mentors to your next team meeting.